Lightroom gives you all your digital photography essentials in one fast, intuitive application. Lightroom gives you all your digital photography essentials in one fast, intuitive application. Efficiently find and organize all your photos. Perfect your shots with powerful one-click adjustments and a full range of advanced controls. Easily share your work on social networks, in video slideshows, in HTML5 web galleries, and more. 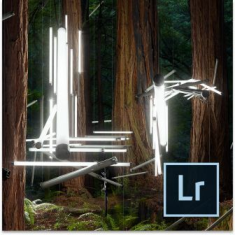 Lightroom is available as part of an Adobe Creative Cloud membership or as a standalone perpetual app. Nondestructive environment—Set your creativity free in a nondestructive editing environment that lets you experiment without limits. Your original images are never altered, and it's easy to reverse your steps or save multiple versions of any photo. Advanced black-and-white conversion—Gain powerful control over the tonal qualities that make or break black-and-white images. Precisely mix information from eight color channels when you convert to grayscale. Develop Presets—Save time by instantly applying favorite looks to your images. Just save Develop settings as a preset and apply it to your other photos at any time with one click. Lightroom includes dozens of built-in presets and thousands more are available from third parties. Facial Recognition—Quickly find images of family and friends, even without metadata tags. You select a face in one photo, and Lightroom searches for that person in all your other images. Categorize and group your photos based on faces. Upright—Straighten tilted images with a single click. Upright analyzes images and detects skewed horizontal and vertical lines, even straightening shots where the horizon is hidden. HDR Merge—Create natural-looking or surreal images from extremely high-contrast scenes. Using HDR Merge, you can easily combine multiple shots taken with different exposure settings into a single high-dynamic-range image. Panorama Merge—Capture superwide fields of view and amazing detail. Photomerge technology lets you stitch together multiple images, including raw files, to create stunning panorama shots. Performance improvements—Import and perfect your photos faster than ever. Lightroom takes advantage of compatible graphics processors to boost its overall speed, especially when you’re enhancing images in the Develop module. Advanced Video Slideshows—Create beautiful, polished slideshows using still images, video, and music along with professional effects like pan and zoom. Photoshop Lightroom 6 system requirements.